I’ve written about this a few times in the past, but I always seems to learn a little bit more around the role of technology and analytics with fitness. This year, my New Year’s resolutions is to try to get in shape… Again. According to a Inc., exercising along with eating healthier and losing weight are the top three New Year’s resolutions each year. My challenge is that over the years, I’ve gone from being an avid runner to a car service, driving my children to hockey rinks and lacrosse fields on the weekends. As a result, my exercise routine have been non-existent for very long stretches of time. However, this year, I’m hoping that things will be different. As an analytics geek, I wanted to start with analytics to weed out all of those built-in excuses that I always seem to use and learn from my past failures. Today, we have access to data around our personal well-being and there are data collection tools everywhere. We wear them on our wrists, have them in our pockets, and have them built into our equipment. While these tools serve as great motivators, they all seem to fall short in 3 key analytical areas. * Data in. Not data out. These tools do an excellent job collecting large amounts of data, but fall short in analytics. They provide summary level view of fitness activity over time, but with limited abilities to explore the data further. * Lack of self-service. Their “dashboards” are never quite the way I want them. We all use slightly different metrics and different ways to visualize our fitness activity, but unfortunately, we are limited to static dashboards that can’t be modified easily. * I want “other” data. No one tracker really tells the whole story because they’re all used for specific purposes. Additionally, these “apps” are all isolated from one another with no unified way to bring this data together, especially data from other sources, like weather, music, or schedule. This is important because when it comes to physical fitness, we tend to only see the data relationships and associations that we want to see. Each day, I’m working with customers and prospects to build and develop innovative analytical solutions to solve their real-life complex information needs. While there are many tools on the market, SAP Analytics Cloud provides the ability to dynamically visualize, predict, and plan my progress. As you can see, this is the same problem that I’m trying to solve, so I thought that I would put this to the test. Your iPhone is a very reliable indicator of your activity. It tracks activity, distance, steps, and flights climbed. Apple allows you to export this data and you can very easily track your overall activity. How Active Have I Been? The following graphics summarize what my phone has been collecting about me over the past 2+ years. If you’ve having a hard time reading the visuals, it’s telling me that 2018 was a down year. I’ve traveled less, I’ve climbed fewer flights of stairs, and I’ve decreased my step count. When Am I Typically More Active? The following two graphics show my activity (over a 2.5 year period) by day of week and by hour. I’m the most active on the weekends and the least active on Mondays – which is not a surprise. What did surprise me is that my activity is the highest late at night and very early in the morning. I fairly consistently use runkeeper to track my overall running activity. Similar to the iPhone, it’s very easy to export this data for analytics. It allows me to easily see my running distance, duration, and pace and then gives me breakdowns of both my total weekly distance and average distances. How Much Have I Run This Year Compared to Last Year? Here’s a view into the dashboard that I built to track my fitness activity. Unfortunately, 2018 was a down year – not just with steps but also with running. I ran less, went on shorter runs, ran slower, and ran flatter routes. How Consistent Have I Been? If I drill into the individual months, there’s a lot of Null values. I had a big spike in the summer/fall of 2017 and I’ve been very inconsistent since then. Can I Get Enough Steps In If I Don’t Run? The following graphic shows the combined numbers between my iPhone and Runkeeper. If you look at the individual days, there are plenty of days where I’ve gotten a significant amount of steps in without running. 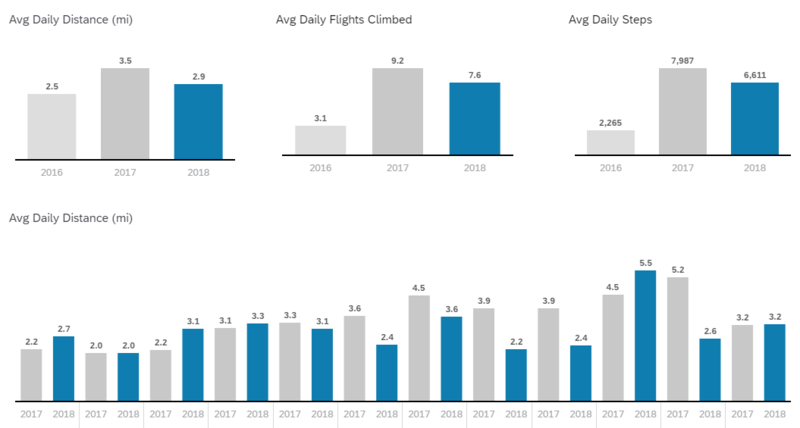 However, if you aggregate the data (at a monthly level to remove the outliers), you can see a different trends where running is critical to getting my steps up. In the months where I don’t have any significant runs, my steps are much lower. What Impact Does Weather Have On Activity? What has been the impact of weather on my daily activity. In the following visual, there’s a small correlation between activity and temperature (left) and a small correlation between activity and rain. That is, the colder it is, the less active I am. Also, the more it rains, the less active I am. What Impact Does the Weather Have on Running? The following two visuals show the impact on temperature on running distance (left) and rain on my running distance (right). The first chart (left) show that there is no correlation between running and weather. That is, I don’t appear to run any shorter and any slower based on the weather. However, in the rain chart, you can see that the vast majority of the dots are at the bottom. This means that I don’t like to run in the rain. * Structure running activities have been my best form of exercise. * But running alone is not enough. Running enough with your kids on the weekend, walking your dog, or going on a hike can be much more effective. * Don’t use the weather as an excuse. This, apparently, has been my built-in excuse for years. As you can see, analytics is all around us. In addition to being a top priority across all organizations, it should be a top priority for individuals to better manage their lives and their health. Using data to gather and build new insights allows us to be more productive, make better and more informed decisions, and hopefully live healthier lives. Being able to communicate your findings effectively increases your chances of getting the message heard and understood. Want to know how to get your data into this app? Message me and I’d be happy to share the whole story.